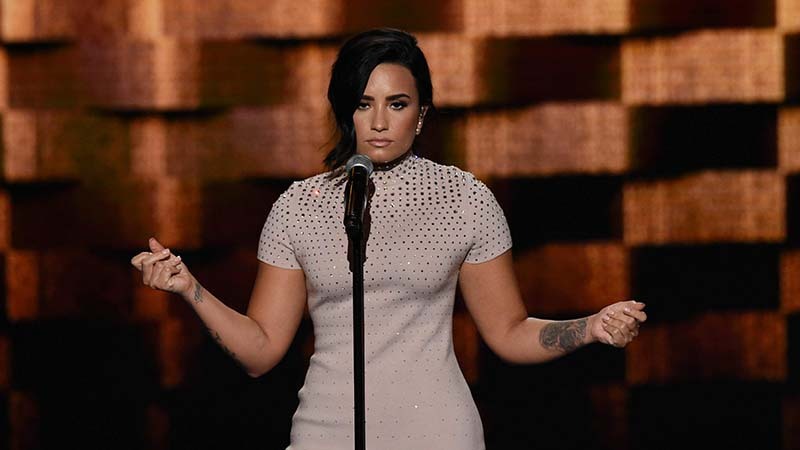 Demi Lovato has opened up about her struggle with mental health illnesses in a speech at the opening night of the Democratic National Convention. The 23-year-old has been open about her bi-polar condition, substance abuse issues and eating disorders in the past. She told the crowd at the convention “we can do better”. The singer then performed her track Confident. The Democratic National Convention is their equivalent of a party conference, ahead of November’s election. It’s where it will be officially confirmed that Hillary Clinton will run as the Democratic candidate for president of the United States. She added that she wanted to “urge every politician to support laws that provide better access to healthcare and support for everyone”. She also revealed that she’s been touring with members from the treatment centre when she went for help, to give other people the opportunity to get help too. “Like millions of Americans, I am living with mental illness. But I am lucky, I had the resources and support to get treatment at a top facility. “Unfortunately too many Americans from all walks of life don’t get help. Either because they fear the stigma, or cannot afford treatment,” she said. Demi, who’s currently on tour with Nick Jonas, told the convention that she is “living proof that you can live a normal and empowered life with mental illness”. “Untreated mental illness can lead to devastating consequences, including suicide, substance abuse and long-term medical issues. “We can do better. Everyone of us can make a difference. By getting educated on this epidemic and its frightening statistics, and by breaking the stigma.